It's been a while, but I'm back with another edition of "I've Heard of These People, Why Haven't I Heard of This Movie?". Today's entry doesn't contain any huge stars or A-Listers, but it contains enough familiar faces to make one wonder why it's suddenly showing up on home video. 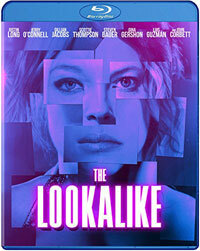 The Lookalike is a great example of how a movie can gather enough B-List actors to get our attention. And, it's also one of those movies which makes us wonder how out of all of those people who have worked steadily in the past, why didn't any of them realize what they were getting into? Nightclub owner and drug dealer Bobby (John Corbett) has gotten himself into a bit of a predicament. He has crafted an unusual deal with William Spinks (John Savage). Bobby has found Sadie (Gillian Jacobs), a woman who Spinks has known since childhood. In exchange for spending the night with Sadie, Spinks will finance Bobby's operation. But, before the deal goes through, Sadie dies. Bobby turns to his employee Joe Mulligan (Jerry O'Connell) for help in finding someone who can pass for Sadie. Joe is interested in making extra money, as he wants to start his own cooking show. Yet, he's pre-occupied with a woman he has just met named Mila (Scottie Thompson). Meanwhile, Joe's brother, Holt (Justin Long), has also met a woman, and this woman, Lacey (Jacobs), is a dead-ringer for Sadie. When Joe meets Lacey, a plan begins to develop which could benefit everyone involved. We all know that movies exist A) to make money, and B) to entertain, but sometimes we can't help but wonder why certain movies were made. With The Lookalike, it appears that the filmmaking team of Director Richard Gray and Writer Michele Davis-Gray, who have dabbled in other genres, decided that they wanted to make a Pulp Fiction-like dramatic thriller which features many characters and several subplots which tie together. Well, they certain succeeded in that aspect, as The Lookalike does indeed contain an array of character and there are at least five sub-plots here which begin colliding as the film goes on. The problem is that we've seen it all before. The only aspect of the film which feels original is when Joe claims that he's doing it all so that he can have his own cooking show. But, coming from Jerry O'Connell, one can't help but wonder if the movie is pulling our leg with that. Outside of this odd nugget, The Lookalike is filled wall-to-wall with cliches -- the seedy nightclub, its seedy owner, the guy who wants out of his bad situation, the charming junkie, and the stereotypical cops. One watches a movie like The Lookalike and thinks, "OK, it's laid out all of these familiar characters and situations, now it's going to do something different." But, it never does. As with many films of this ilk which fall into the neo crime thriller genre, the worst aspect of The Lookalike is that it's boring. The movie spends so much time introducing characters and bringing in subplots that it actually forgets to move the story forward and allow anything to happen. There is some action at the end, but it's too little too late. The movie isn't afraid to kill off characters, but as we didn't really care about them, it's no big deal. The most shocking aspect of The Lookalike is how Justin Long (who along with his brother, served as a producer on the film) continues to work to shed his background as a comedic goof. I would much rather see him reprise his role in Dodgeball than to appear in something like this. The Lookalike shows that we all need to inspect our light fixtures on Blu-ray Disc courtesy of Well Go USA. The film has been letterboxed at 2.35:1 and the Disc contains an AVC 1080p HD transfer which runs at an average of 20 Mbps. The image is fairly sharp and clear, showing only a hint of grain and no defects from the source material. The colors look good, but some of the nighttime scenes are a hint too dark. Overall, the picture has a somewhat flat look, and a few shots are soft. The Disc carries a DTS-HD Master Audio 5.1 track which runs at 48 kHz and an average of 2.4 Mbps. The track provides clear dialogue and sound effects. The stereo effects are OK, as we get a hint of sounds coming from off-screen. The finale offers some surround sound effects and the music in the nightclub brings some mild subwoofer effects. The Lookalike Blu-ray Disc contains only a smattering of extras. We get four DELETED SCENES which run about five minutes. These are all brief scenes and they don't introduce any new characters or subplots. "Behind the Scenes" (15 minutes) contains comments from the cast and the creative team, as they discuss the story, the characters, the production, and the location shooting in New Orleans. The piece includes some on-set footage and production stills.